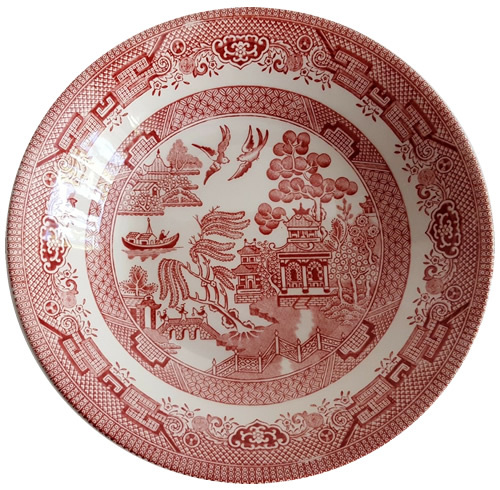 In the late ‘70s, A&P Grocery Store let you buy a plate, cup and saucer in the Blue Willow Pattern for 99 cents any time you bought $10 worth of groceries. They were made by Churchill. I bought eight. The other pieces cost more. I bought some, but mostly mixed in the white dishes I already had. Over the years, I picked up other pieces as I found them in thrift stores or at garage sales. Then I found the whole set at Tuesday Morning. They were also made by Churchill, but these had a swirl pattern. Years pass, some dishes got broken, more were found at thrift stores. Ingles had the same deal again. This time they also had pink or red willow and I bought some of those, too. Belk had a full set of Blue Willow. I bought them. They were made by Johnson Brothers. 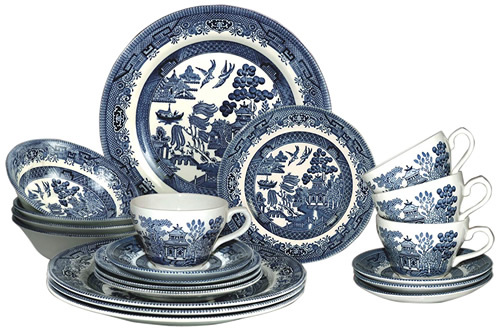 I had Blue Willow china make by lots of different brands stacked everywhere. They are different sizes. Especially the bowls. Even the bowls from the same company won’t stack. Chuchill has two kinds of bowls, but over the years they are slightly different sizes so they won’t stack inside each other. I had three different kinds of cups, three different kinds of mugs and three times as many saucers as cups. Now I was living in the log cabin. I decided to just narrow it down to one brand so I could fit them in the cabinets better. I sold the rest on Facebook Marketplace and bought the pieces I was missing to fill out a set for 24. 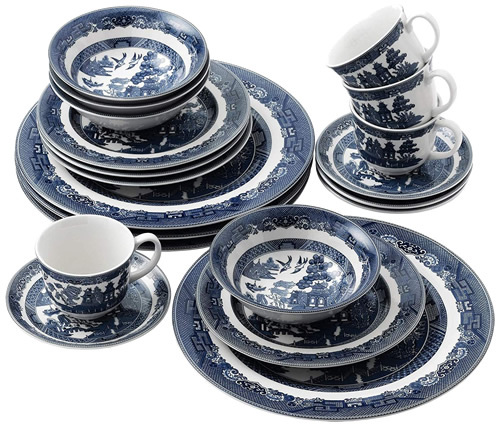 Yes, should I have a dinner party for 24 people, we can all eat from matching dishes. At least until something gets broken. But now it is really easy to get the pieces you want. You don’t have to wait to find them at a garage sale. They don’t even cost much. 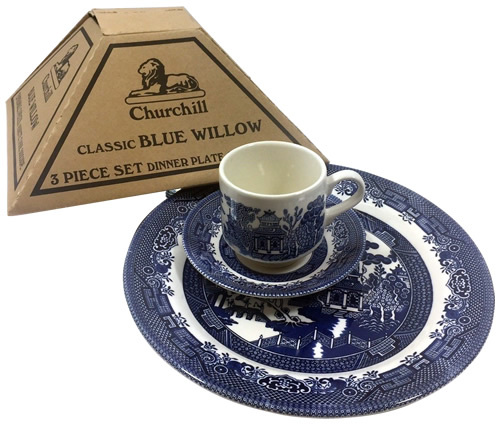 You can get a whole box full of matching Blue Willow china and all the additional pieces your heart desires. It’s still fun to find them at a garage sale, though. 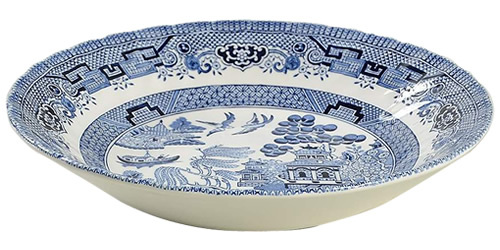 This entry was posted on February 9, 2019, in Blue and White, Traditional and tagged Blue and White. Bookmark the permalink.